The Star Banquet Oil Lamp is a twinkling twist on a versatile classic! Tiny, embossed stars circle the clear glass font of this traditional flat wick oil lamp, giving it an elegant, festive appeal that works perfectly for special occasions as well as for everyday or emergency use. 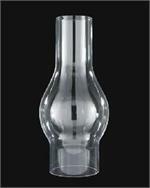 2 1/8 inch fitter by 6 1/2 inch height and 3 inch bulge for #0 Size Eagle Flat Wick Oil Lamp burners.